More than twelve thousand devotees thronged the Lord Vishvanath Temple to pray and seek the blessings of Lord Shiva on Maha Shivratri (March 6, 2008) at Sivananda Ashram, Ahmedabad. Chants of "Om Namah Shivaya" charged the air of Sivananda Ashram with Divine Vibrations. The Siva Lingam was worshipped by washing it with milk, curd, honey and rose water as the chants of Vedic Hymns, Namakam, Chamakam, Rudram and "Om Namah Shivaya" in praise of Siva continued. Continuous twenty five hours Siva Lingam worship services, including Lagurudra began in the early hours of dawn, 4.00am on March 6, 2008 until the next day 5.00 am on March 7, 2008. Siva Lingam was adorned with special Shringar and Rev. 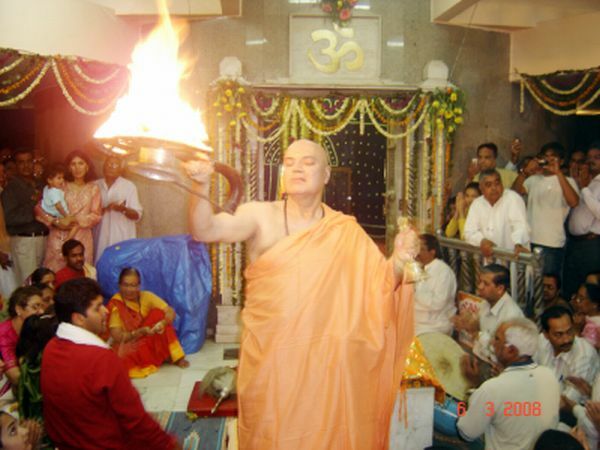 Swami Adhyatmanandaji Maharaj performed Bhasma Arati. Siva temple was full of Bel (Bilva) leaves, which were offered to the Lingam. Bel leaves are believed to be very sacred. Bhakti Sangeet (Devotional Songs) in praise of the Lord by different musical groups (from 5.30pm until 5.00am) from Ahmedabad, Baroda, Bhavnagar, Jamnagar, Rajkot, Bharuch, Surat, Mumbai and Jodhpur of Rajasthan added a special fervor to already charged atmosphere with divine vibrations. Mahaprasad was served to all on next day. On March 4, 2008 Sri Swamiji Maharaj inaugurated four days long "Shivratri Retreat" organized at Chinmaya Mission, Ahmedabad. On the same day sixty different colleges of Gujarat University visited Sivananda Ashram. Three hours symposium was organized and was attended by large numbers of students. It was concluded by Swamiji's address to the student assembly on the subject of ' effective speaking'. Pranav is Omkar. Pranav or Omkar is the essence of the spiritual Sadhana. Regular chanting of Omkara is the quintessence of Pranayam science. Pranayama is an important limb in the Yoga of meditation. It is necessary for all, in their daily life, for good health, success and prosperity in every walk of life. Swami Pranavaurnyamji Maharaj,( aged 87 years old) concluded his deep meditation and Pranav chanting for nine days.Under His guidance and leadership meditation retreat was organized and sincere Sadhaks participated in nine days rigorous spiritual discipline at Sivananda Ashram, Ahmedabad starting from Feb 25, 2008 which concluded on March 3, 2008. It included daily total nine hours of Meditation on 'Omkar' (Pranav Dhyan) in three sessions, discourses for two and a half hours in two sessions. The entire program was directed and guided by Most Worshipful and Revered H. H. Sri Swami Pranavaurnyamji Maharaj (also known as Swami Protoplasm). His entire vision "TO KNOW THY SELF" is based on teachings of Bhagvan Sri Sri Sri Ramana Maharshi. Inspiring educational video films also were shown to participants. Satvik food, dates, fruits etc were served to all the participants. Sadhakas observed total silence through out the Meditation Camp. On March 24, 2008 happy birthday of Doctor Sri M. J. Pattani Saheb, a senior devotee and ex-acting president of the ashram was celebrated. A special worship was performed at Lord Sri Vishvanath Temple of the Ashram for his good health & long life. Feeding to poor and Grain distribution to needy and sick people was done on Third of the month. As always, Regular Yoga sessions were conducted through Yoga Center. Also, daily prayers, worship services at the Lord Vishvanath temple of the ashram, weekly Sunday satsangs and other spiritual activities Satya Narayan Puja, Sri Lalita Shahashranama chanting by Devi group were performed . On March 8, 2008 Lion's Club, Baroda organized a special function to celebrate International women's day. It was held at grand stock exchange hall. Sri Swami Adhyatmanandaji was invited as a guest of honor. Swamiji spoke on the glories of Mother Divine. The women of India have preserved the spiritual character of our society. See woman as the Energy of God. He said that woman is the Divine power on earth. Woman is an Embodiment of sacrifice, Ahimsa and patience. Woman is an embodiment of patience, gentleness, softness, sweetness, service and Ahimsa. Swamiji cited the example of a great women of ancient time Gargi, Maitri, Arundhati & Madalsa to name a few and Women are the empowerment up to the present age in all field of life. Swamiji condemned the abortion of the female child and brought a spotlight to protection of women. With great enthusiasm & devotion thousands of devotees gathered to celebrate Happy Birthday of their beloved H. H. Shri Jashbhai Saheb at Mogri (Anand). It was celebrated in spiritual way in holy presence of many Saints of Swaminarayan order. A group of devotees with Pujya Swami Adhyatmanandaji Maharaj from Sivananda Ashram, Ahmedabad also joined in the happy occasion. Shri Swamiji Maharaj poured his heart by praising Revered Sahebji that He is a rare gem in the spiritual kingdom, who is embodiment of total purity and truth. His Gurubhakti to his Gurudev, Yogibaba and Lord Swaminarayan is unparallel. Sri Shahebji has inspired hundreds & thousands of people young & old to this royal path of perfection. On March 18, 2008 Sri Swamiji was chief guest at Utopia School for the function held in memory of late veteran and educationist Mr. Hasmukh Patel. It was attended by many dignitaries & Religious heads of different sect. As always, Swamiji Maharaj honored the invitation & inaugurated number of corporate houses, business offices and graced house warming function during this month.